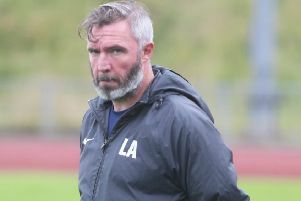 Longridge boss Lee Ashcroft still had a bitter taste in his mouth after Saturday’s defeat to rivals and league leaders Fulwood Amateurs. Town lost 1-0 to a penalty and missed a number of opportunities to score, especially in the first half. Longridge have now fallen nine points behind Tony Hesketh’s men at the top of the West Lancashire League Premnier Division table, although they do have two games. Ashcroft is keen to see his men get back to winning ways when they face Slyne with Hest at home on Saturday. He said: “We’ve got to win as many games as possible if we want to stay in the position thatwe’re in. We were lucky to beat Slyne in the cup earlier in the season, we must play better than we did then. Ashcroft has bolster ed his squad with the siging of former Preston midfielder Paul McKenna and the loan signing of Curtis Haley from Padiham.